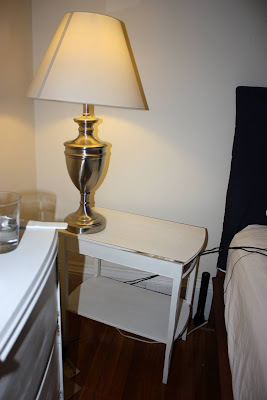 In case you missed my before and after guest post over at Pure Style Home, here is my bedside table that I put a little elbow grease into. I used a wood grain tool for the top and used gray paint mixed with glaze to get the right texture. The tool is not as hard to use as it looks- it takes some practice but its easy to get the hang of. One project in the bedroom down, only 100 more to go. Which is always the case these days- projects just keep piling up. I love the new top... very chic! Wow I haven't seen that type of finish before- it looks awesome! Would you be willing to do a tutorial? I caught this post and was amazed. The table is so cool...I need one of those tools. Then my house would be covered with faux wood grain along with chalkboard paint! That looks great! Wish I were that creative. Good luck with your other projects - I can totally relate to the feeling that it never ends! I did miss it, so glad to see it now! The top looks fab. Especially love the yellow flowers contrasting with the gray top. saw that and thought it was wonderful! I want to do it! it looks great! u go gf! That looks so great! I love it! 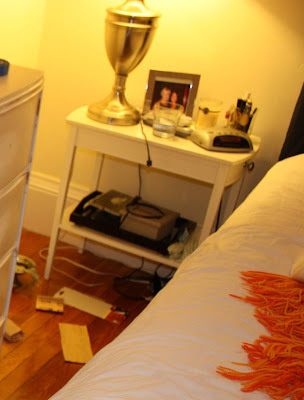 What a dramatic and chic makeover! I love the color choices and the daffodils are the perfect finishing touch. Good work, my dear! Your table looks fantastic! And your gorgeous flower pillow caught my eye too! So pretty! LOVE this! What a great transformation. You must be so excited when you wake up in the morning! That really looks great - must be such a good feeling! still loving it! I think I have a tiny table this could work on! Might need to hold off on one more project right now...but soon! That wood grain tool thing is awesome. Everything looks very nice..love that lamp too. Nice job! I love the gray top!! Very nice, well worth the effort. Love the after! What cute styling with the daffodils in the milk ceramic vase! saw it, loved it, need you to make me one! Wow!!! Your tabletop looks great!!! I love it! This looks so good!! I've been thinking about doing this to my ruined dining room table top...you may have convinced me.